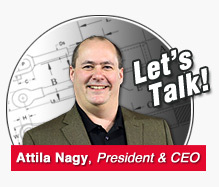 Clips are usually spaced about six wire rope diameters apart to give adequate holding power. They should be tightened before the rope is placed under tension. After the load is placed on the rope, tighten the clips again to take care of any lessening in rope diameter caused by tension of the load. A wire rope thimble should be used in the eye of the loop to prevent kinking. 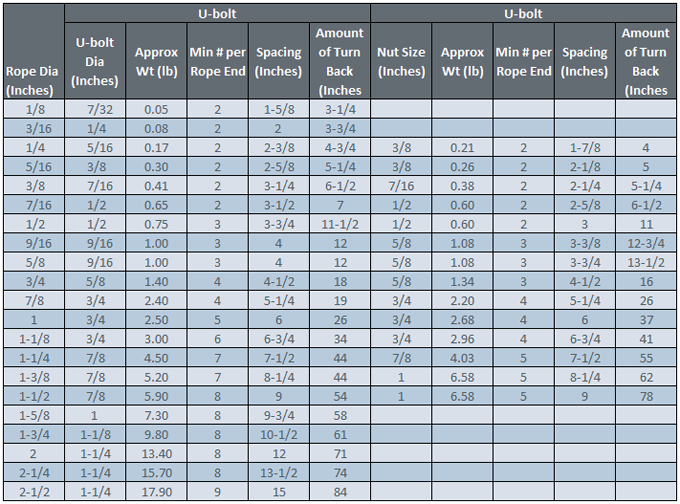 The correct number of clips for safe operation and the spacing distances are shown in the table below. U-bolt Clips. 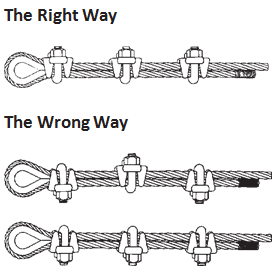 There is only one correct method for attaching U-bolt clips to wire rope ends, as shown in The Right Way image below. The base of the clip bears on the live end of the rope; the “U” of the bolt bears on the dead end. Compare this with the incorrect methods. Five of the six clips shown are incorrectly attached—only the center clip in the top view is correct. When the “U” of the clip bears on the live end of the rope, there is a possibility of the rope being cut or kinked, with subsequent failure. Twin-base Clips. Twin-base clips are installed as shown below. Due to their special design, they cannot be installed incorrectly.